One or more photo(s) has been virtually staged. 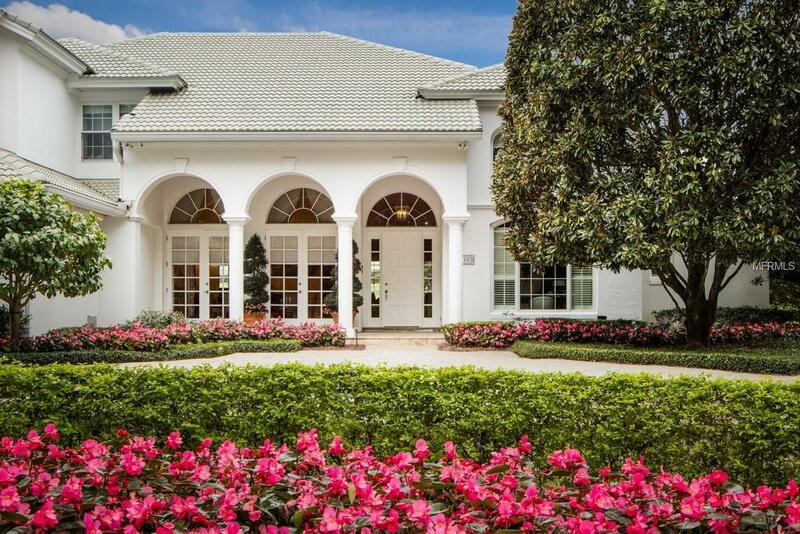 Positioned along the front nine of Isleworths renowned championship golf course, this beautiful estate offers sweeping golf vistas of the 5th fairway. A clean, light exterior facade accented by stately columns and arched windows lead to the covered entry that opens to more than 4,800 square feet of living space. With the formal dining room on one side and the home office on the other, the foyer reveals a classic living room with built-in display shelves and picture windows capturing the dramatic golf course views. A well-appointed bar serves the formal dining room and leads further into the center-island kitchen with an adjacent breakfast nook and professional appliances by Viking, Miele, General Electric and Sub-Zero. An expansive family room sits adjacent to the kitchen and breakfast nook, offering custom display shelves, a corner fireplace and dramatic views of the golf course and grounds. The home offers five bedrooms, including the master suite and guest bedroom on the main level. The master offers a lovely bath with walk-in closet, soaking tub and dual sinks. Outside, the fenced grounds showcase a lovely open-air swimming pool and spa with water feature, as well as a private putting green and separate covered summer kitchen and dining area all overlooking the beautiful golf course views. Additional Water Information The Isleworth Community is Set Along Six Of The Lakes Within The Much Desirable Butler Chain Of Lakes. We Offer A Private Community Boat Ramp For Our Residents Eager To Enjoy These Great Waters. Amenities Additional Fees Club Amenities Are Available To Club Members Only. Residents Of The Community Are Not Required To Join The Isleworth Golf & Country Club. Pet Restrictions Per Orange County Breed Restrictions And Leash Laws. Listing provided courtesy of Isleworth Realty Llc.